That's a odd way of looking at a "league campaign"? Of course, performance levels having dropped is something to be discussing, but there are also a lot of mitigating factors: he's not signed any one player yet and the squad has also been decimated by injury. Those 2 losses we deserved at least a point, so looking at the numbers, its been rather good! And the two wins against Watford and Westham we deserved feck all. Not really, but ok. Performances have been worrying though. For contrast, Mourinho's 17 games before he was sacked. That table shows what the players are able to do. They would do much more with much better coaching. Waiting for Jose fans' sarcastic post "but it's the manager" or how "Jose was always correct". Nah, over a league season you'll always have good runs of form and bad runs. 2 wins in our last 6, with the 4 losses being away to Arsenal, away to wolves in the cup, away to Wolves in the league, home to Barcelona. Basically theres worse fixtures to lose and none of them were a huge shock tbf, the only one of those I would've expected to win was one of the Wolves games (which we shouldve based on the performance). The slump from the past few weeks is a positive in a sense that we get to see how Ole handles things in this situation. How will he get the team back into form again. We had some very good results no doubts about that. My biggest worry is that bar the first few games when Ole took over, we are basically identical to Jose's 2nd season. Disjointed, relying on pure luck or opponents inability to convert chances, can't control games and have prolonged periods of time where we can't even string 2 passes together and no matter who we play, we struggle a lot, usually winning 2-1. We all know what happens when suddenly things are not going your way. 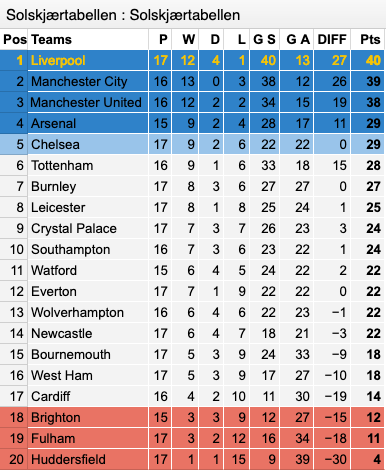 I think this table doesn't reflect how far behind City and Liverpool we are. Averaging 2.375 ppg is a too job considering how poor some of what we carry are and an injury crisis in between. That's 90 points over a season. A similar record next season would be fantastic. That is one of the most mental things I’ve ever read. Those six games have seen us play four top sides. Overall we are doing fecking amazingly while Ole deals with the worst squad we’ve ever had and has had horrendous luck with injuries as well. Basically though, shows we've been the 3rd best in the league with a gap between those below and those above. 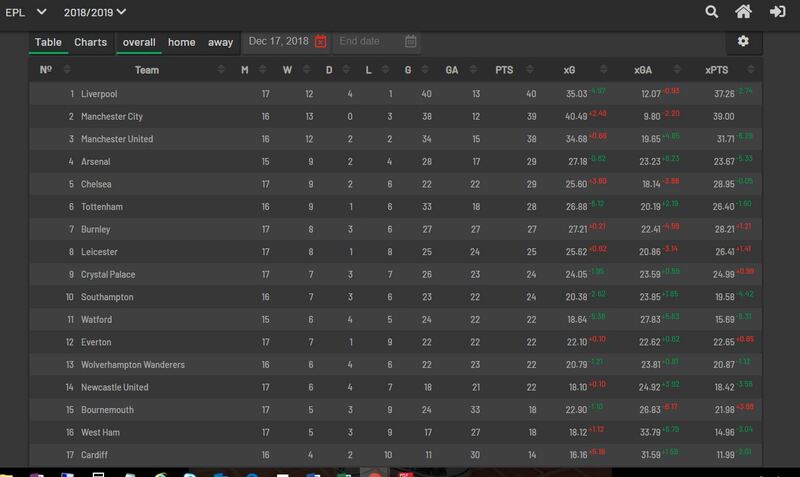 Another interesting quirk of the data is that - even if you only consider our last six league games - our win % is higher than any other team in the table in the OP, bar City and Liverpool. All anyone should be looking at, like ALL? Then to judge Ole you need to exclude all our wins. In that case, I'm going to judge your entire contribution to this forum on this post... Here's a question, do you think we have been in a better position in the league or Champions League if Klopp, Pep, or Poch had taken over in December?... working with the same injuries, and without signing anyone in January. Spot on but to me the most impressing thing about him is the change in style. We got played by westham but we’re still confident as a team to try and play the ball. Even if we were second best at some points in the match I’m glad the team never went back in it’s shell like they would under mourinho. I don’t want this to turn into a mourinho vs ole thread but it has to be said. Imagine if mourinho wasn’t such a negative shite we could have been up there. Clearly Ole has done a great job, but people are moving the goalposts now. In December we were out of the Top 4 race, we'd just drawn PSG who we were never going to beat, and we had conceded as many goals as we'd scored. That's why Mourinho was sacked, but even then most of us knew he wasn't the only problem. Thank you @Pogue Mahone @Samid & @roonster09 for laying it out so well. We've been the 3rd best team in the league since Ole took over, and I didn't think that was possible in December. Now we need to fully back him and bring in some top talent in badly needed areas.